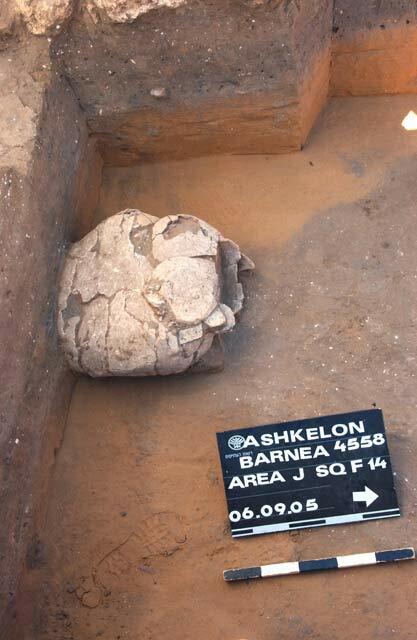 During August–December 2005, a third and final season of salvage excavations was conducted at the Early Bronze I site of Ashqelon Barne‘a B-C (Permit No. A-4558; map ref. 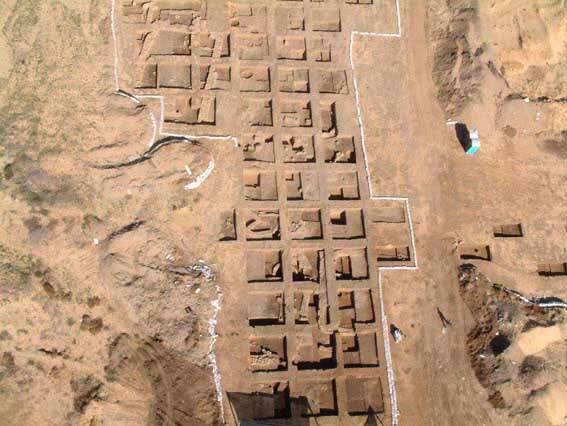 NIG 1597–9/6230–2; OIG 1097–9/1230–2), prior to large-scale housing development. 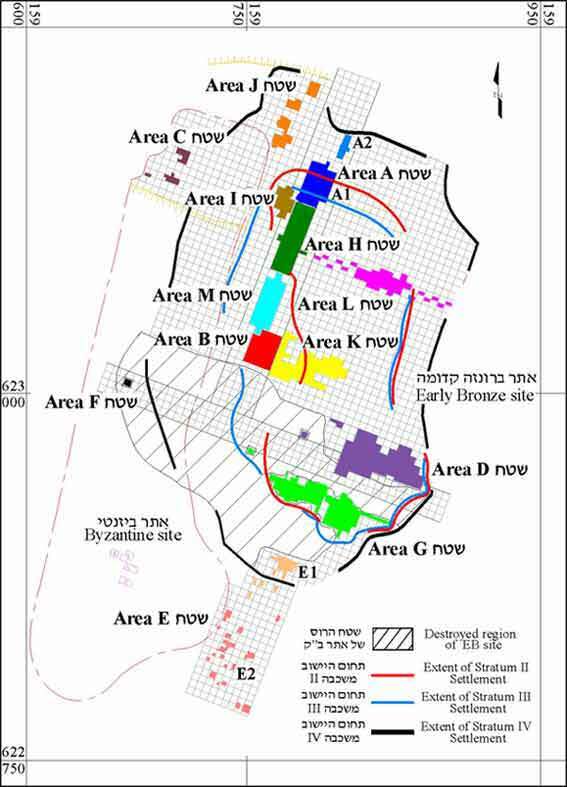 The excavation, on behalf of the Antiquities Authority and funded by the Economic Corporation for the Development of Ashqelon, was directed by A. Golani, with the assistance of E. Alajam, D. Dagan, M. Ein-Gedi, N. Govchenko and I. Peretz (area supervision), S. Talis (registration, ceramic processing and computerized data entry), H. Lavi and R. Abu-Halef (administration), V. Essman and S. Pirsky (surveying), T. Sagiv and J. Kdoshim (field photography), Y. Nagar (anthropology), O. Ackerman (geomorphology), I. Berin (drafting), Y. Bukgenholtz (pottery restoration), E. Boaretto (Carbon 14 dating), D. Rosenberg (ground-stone tools), L. Eisencot and O. Aflalo (organization of student volunteers), Y. Israel and D. Nahlieli (district and regional archaeologists). The excavation was carried out by workers from Ashqelon and Qiryat Gat, as well as local schoolchildren and volunteers from the pre-military college at Netiv Ha-Lamed-He. 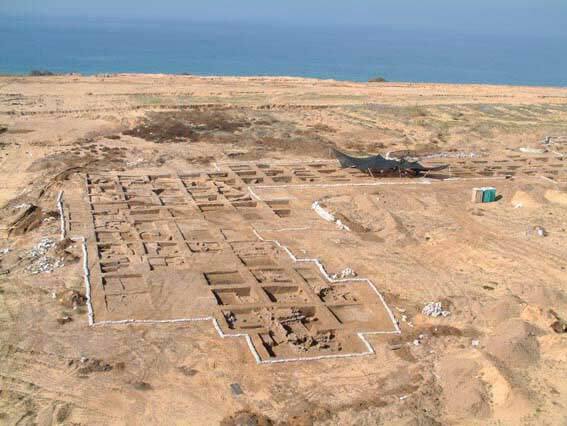 The site is located adjacent to the coast and north of the EB I site of Ashqelon Afridar (‘Atiqot 45). 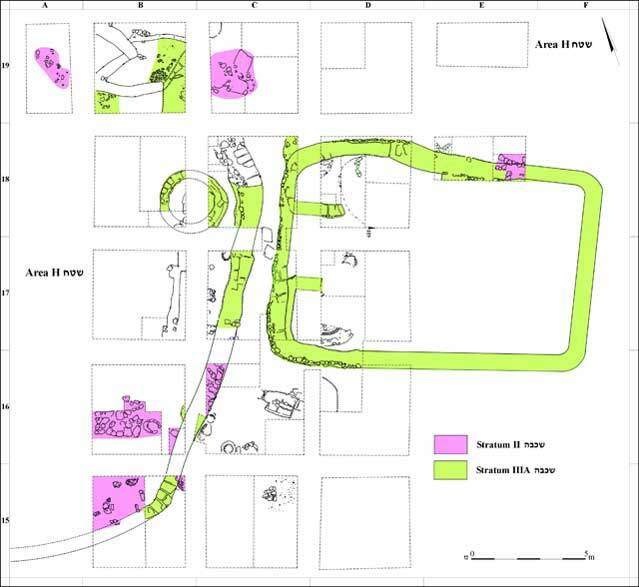 The excavation was preceded by large-scale earthmoving activities that destroyed a large section of the site and removed a large portion of the sand dune that covered it (Fig. 1), exposing a previously unknown settlement of the EB I period. These dunes contained remains of a settlement from the Byzantine period (fifth–sixth centuries CE) that were partly excavated. Unlike the two previous seasons (HA-ESI 117, HA-ESI 119), the present excavation was restricted to the entirety of the northern two-thirds of the site (c. 30 dunams; Fig. 2), portions of which were sounded during the first excavation season. In light of the immense size of the area destined for destruction and budgetary limitations that did not allow a complete excavation, a viable strategy that would provide as much relevant information as possible concerning the extent of the site during the different occupational strata, along with the nature of activity in each of its parts, was formulated, consisting of five principal elements. 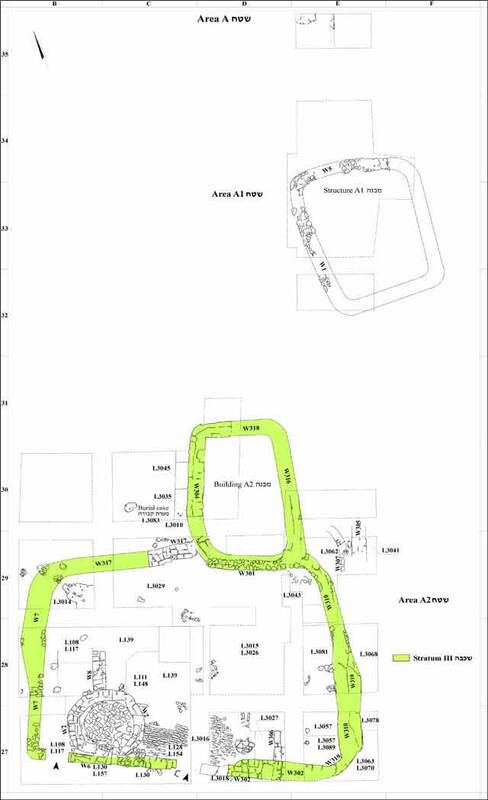 (1) Excavation of a large north–south section (width 15 m; Areas H and M) through the central portion of the site that would connect the northern part (Area A) with Area B in the center, which had previously been excavated. (2) Excavation of another east–west oriented central section (Area L) that connected to the central section. 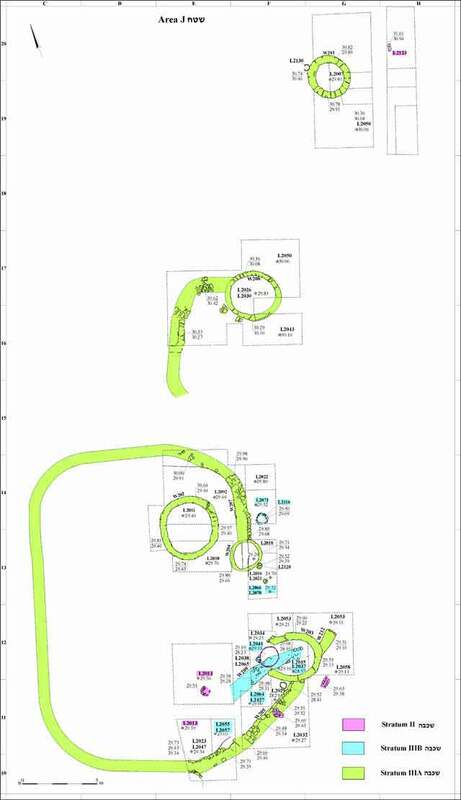 (3) Exposure of any significant architectural remains within these sections will require the expansion of the section to reveal any such units in their entirety (Area I). 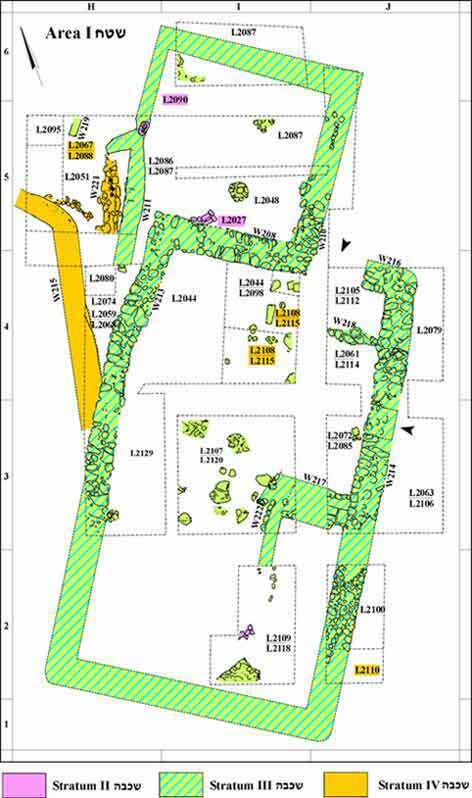 (4) Limited excavations in peripheral areas of the site (Areas J and C). (5) Broad lateral exposures in areas where architectural remains were already apparent upon surface (Area K). 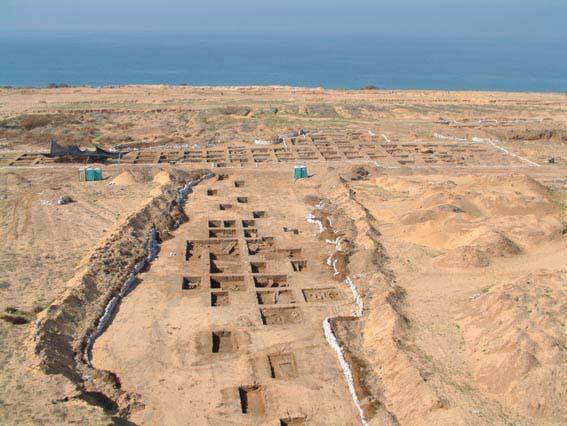 The major occupation at the site took place during the Early Bronze IB period and was spread out over a wide and mild eastern-facing slope that descended from the top of the low kurkar ridge, running parallel and east of the seashore. 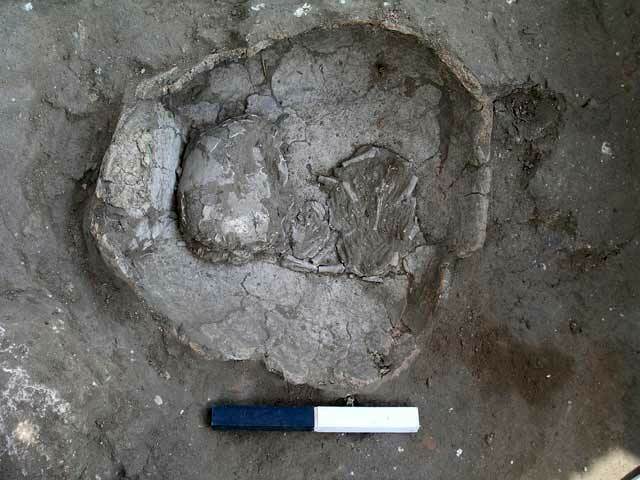 As in the previous excavations, the same sequence of five strata was identified. Stratum V, dated to late EB IA or early EB IB periods, was exposed in a limited number of deep probes. It was characterized by meager ceramic remains and habitation surfaces directly upon and within the upper portion of the sand dune. As no architecture was associated with this phase, it may represent a temporary and ephemeral campsite. Stratum IV, also dating to late EB IA or beginning of EB IB, comprised the first permanent occupation at the site that encompassed an area of c. 30 dunams. The stratum was distinguished by walled compounds and large buildings, separated by wide and open spaces. 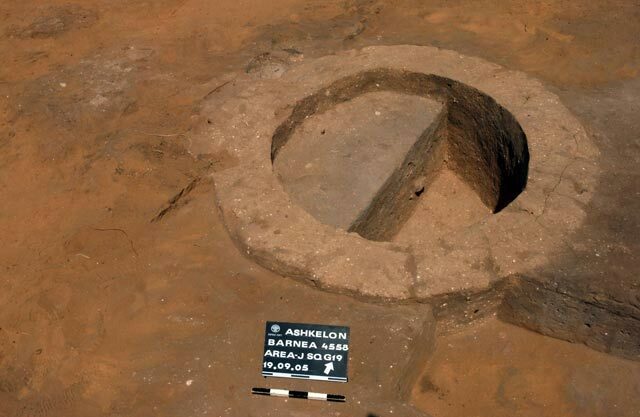 Several underground mud-brick silos were identified in the peripheral regions of the site. 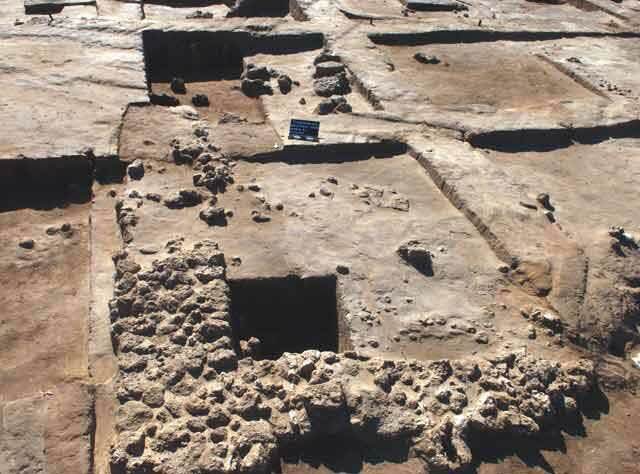 Stratum III, dated to EB IB, was identified in nearly all the excavated areas and represented the largest and most intensive settlement at the site, which now encompassed 55 dunams. It consisted of walled compounds and various buildings whose construction resembled that of Stratum IV. Some of the compounds contained domestic structures, often alongside mud-brick storage silos, while others appear to have been reserved primarily for copper working. The compounds were separated from one another by narrow alleys or open spaces. Stratum II, dating to EB IB, represented a complete break in settlement. The Stratum III site was abandoned and the resettlement during Stratum II was on a smaller scale, reaching c. 25 dunams. This stratum evinced poor architectural remains of small stones, in contrast to the predominantly mud-brick construction of Strata IV and III. A recurring feature of Stratum II was the presence of infant jar burials and mud-brick cists within abandoned areas of the site. 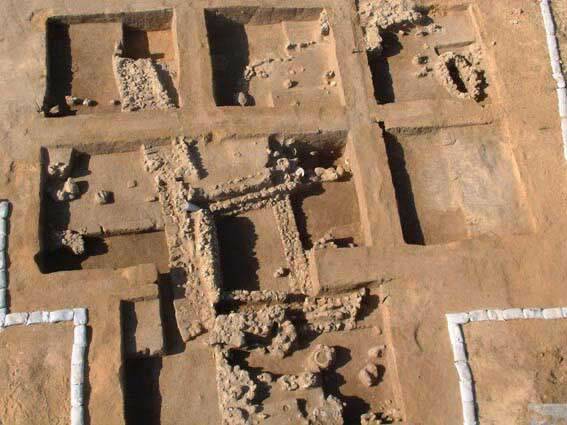 Stratum I consisted of sporadic remains, primarily pits, from the Byzantine period that were found throughout the area of the abandoned EB site, while limited architectural remains were identified atop the kurkar ridge facing the seashore (Area C). 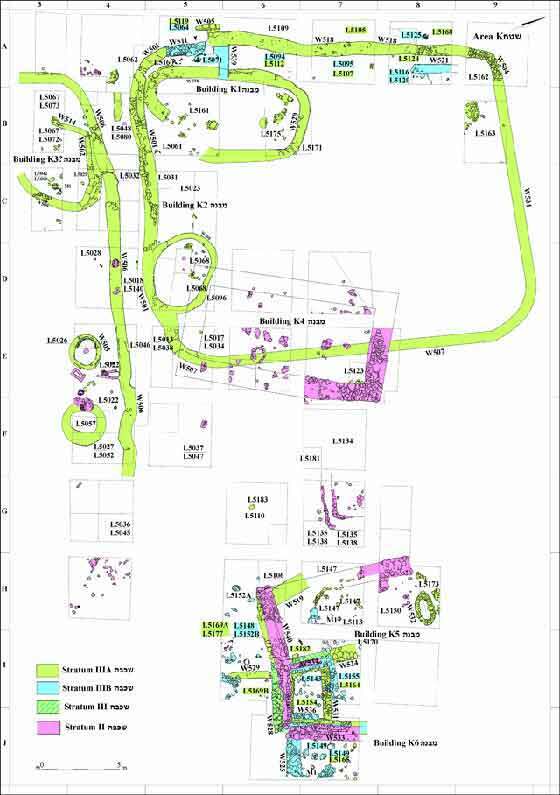 Following is a brief survey of the results from each area of the present excavation season. Area A was to the north of the north–south section (Fig. 3). The excavation area was expanded this season (Fig. 4), revealing the circular storage structure of Stratum III, assigned to Stratum II in HA-ESI 117, which had been part of a badly eroded complex that was composed of a courtyard enclosed by a mud-brick wall (W6, W7, W302, W310, W317) and an adjacent rectangular mud-brick structure with rounded corners (Building A2; Fig. 5). The courtyard, storage structure and adjacent building may represent a habitation complex of a single family. Two entrances in W6 were identified, along with a mud-brick pavement (L3016) within the courtyard and adjacent to the eastern entrance. Area C was located on the western-facing slope of the kurkar ridge and outside the EB occupation area. Excavations revealed several badly preserved walls and decayed plaster installations of unclear plan, all founded upon sterile soil. The finds associated with these features dated them to the Byzantine period (fifth–sixth centuries CE). Area H was in the central portion of the north–south section (Figs. 6, 7). The earliest occupation in this area, Stratum IV, included a few surfaces and a portion of an oval mud-brick structure (Fig. 8), all founded directly upon the sands of the basal dune. These were exposed only when more prominent features of Stratum III were removed or in restricted probes beneath the Stratum III surfaces. The main and most intensive occupation in this area was that of Stratum III. At this time, the northern part of Area H was an open area that included a large rounded storage (?) installation and a pithos embedded into the sands (Fig. 9). 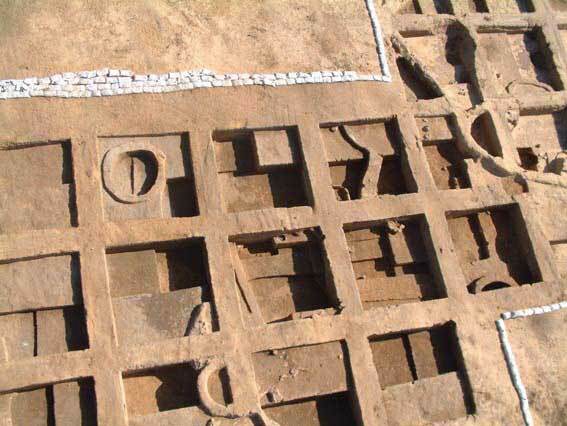 Two walled mud-brick compounds separated by a narrow alley were found in the southern part of the area. The western compound included an underground mud-brick silo, which may have been intended for domestic/storage purposes. The eastern compound appears to have been used for copper processing as it contained several firing installations, slag and large amounts of burned mud brick and ash (Fig. 10). To the south of these two compounds was a large open area that consisted of several infant jar burials beneath the floor (Fig. 11). 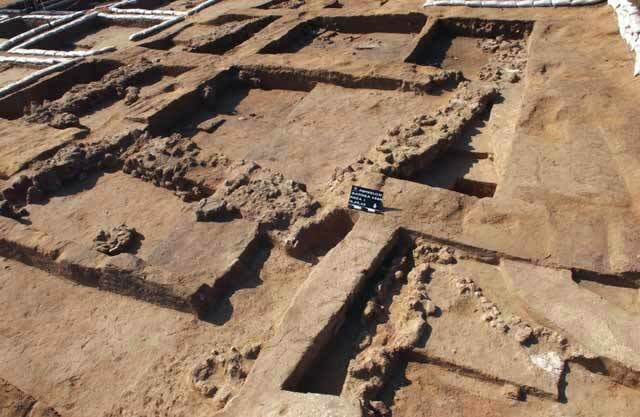 Stratum II included a limited amount of pits along with scattered and disjointed architectural features that showed a distinct break from the earlier remains. Area I was adjacent to Areas A and H, to the west of the large north–south section (Figs. 12, 13). Stratum IV was exposed in a limited area and consisted of a long and curving mud-brick wall (W215), possibly a portion of an enclosure that was not fully exposed. A large building complex that was composed of a walled courtyard (8 × 14 m) and a portion of an adjacent structure to its north were associated with Stratum III. The courtyard, not fully exposed, had an entrance in the north and another in the east, facing a large open area (Area H). 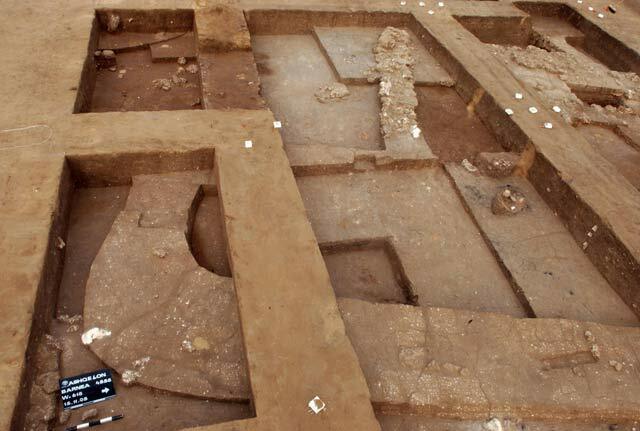 Several partition walls, a melting installation and numerous remains of burnt and decayed mud bricks in the courtyard suggest that some form of industrial activity may have taken place there. Area J was at the periphery of the site, atop the kurkar ridge. 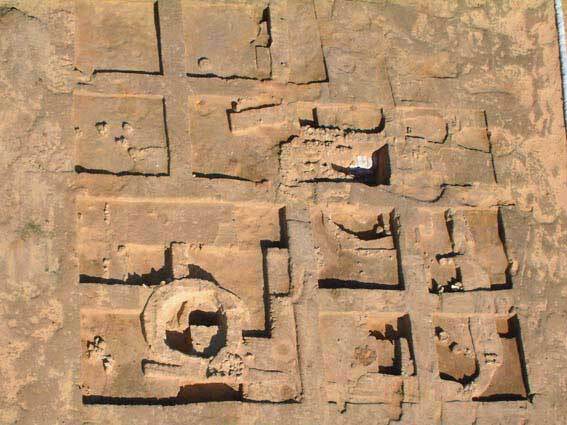 The remains were excavated in several clusters of squares, following the exposure of tops of several mud-brick walls by a bulldozer (Fig. 14). The area was not physically connected with those in the main north–south section (Area A); hence the attribution of its remains to any of the main excavated strata in other areas is uncertain. Nonetheless, on the basis of building materials and construction techniques, the earliest remains in this area should probably to be associated with Stratum III, while remains of Stratum IV in this area are lacking. The Stratum III remains may be divided into two architectural phases. Very little survived of the earlier phase (Stratum IIIB) that included a single mud-brick wall (W209) and several associated surfaces, as well as an infant jar burial set into the sands (Fig. 15). The later phase, Stratum IIIA, remains were better preserved and included several mud-brick silos and associated walls and surfaces (Fig. 16). 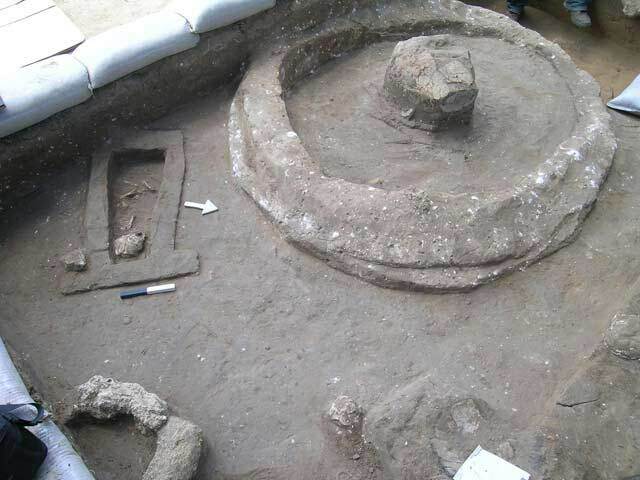 The remains of at least two compounds were identified; the enclosure wall in each of them incorporated at least one mud-brick silo, while in the southern compound an additional mud-brick silo was revealed (Fig. 17). 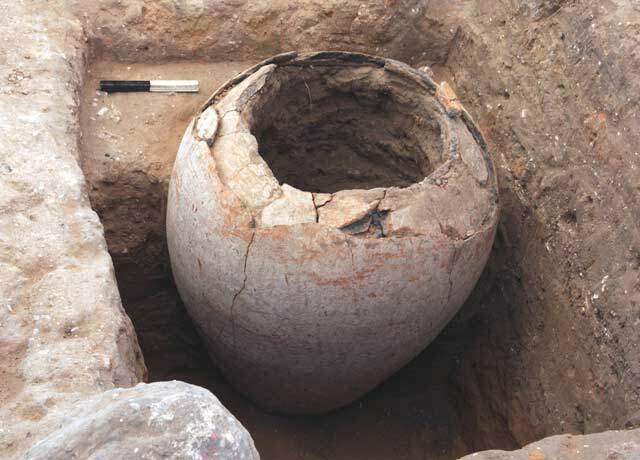 These compounds may have been used exclusively for storage; however, the presence of additional, domestic structures within them, although not excavated, cannot be ruled out. Very few stratified elements, post-dating those of the Stratum IIIA phase, were found. These were tentatively associated with Stratum II and included a few surfaces and a pit along with scattered stones that did not recognize the earlier remains. Area K, in the central portion of the site, was adjacent to Area B on its west (Figs. 18, 19). Since the remains in Area K were apparent on surface, a large lateral exposure was conducted, producing generally shallow archaeological remains of Strata III and II. Habitation debris of Stratum IV was reached in limited exposures in the eastern portion of Area K, where the accumulation was deeper. 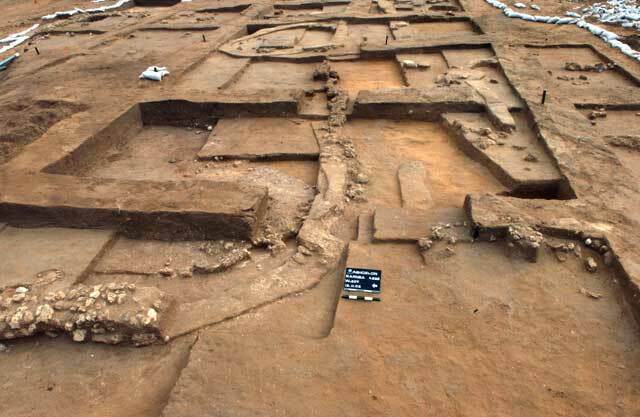 The Stratum III remains included a northern and southern enclosure in the western part of Area K and a dense agglomeration of building remains in the eastern side. Of the northern enclosure, approximately half of a square-shaped compound was exposed, consisting of a mud-brick wall on a partial stone foundation. An entrance with an indirect entry was identified in the western wall, while two oval-shaped domestic mud-brick structures (Fig. 20) were exposed within the enclosure. 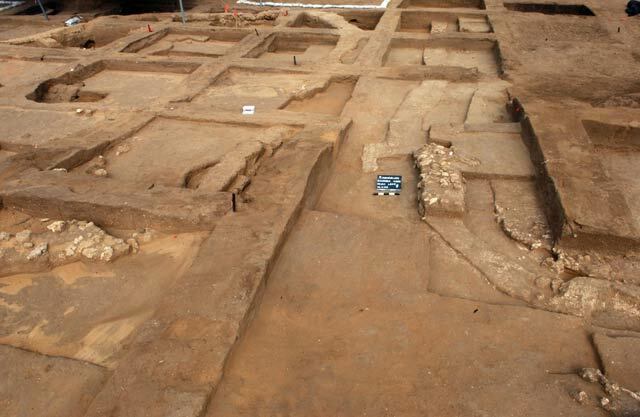 An alleyway separated this compound from another enclosure, which had previously been excavated in Area B and appears to have been of industrial character (Fig. 21). Another narrow alley separated the northern enclosure from the remains of a similarly built enclosure to its south (Fig. 22). 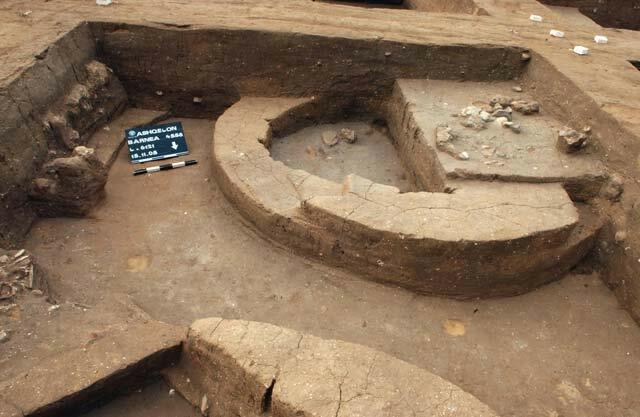 Although partially revealed, the southern enclosure appears to have included two mud-brick storage silos and possibly one oval domestic structure. The building remains in the eastern side (Fig. 23) delineated several rooms of a complex structure of unclear plan that underwent several phases of modification. Within a wall of this structure, a small juglet with a hoard of dentalium shells was revealed (Fig. 24). The remains of Stratum II, as in nearly all other excavated areas at the site, were of a completely different nature, consisting of walls that comprised a small stone foundation (Fig. 25), which obliterated the previous architectural remains of Stratum III. The partial remains of at least two badly eroded buildings and associated surfaces were revealed, as well as several infant burials. 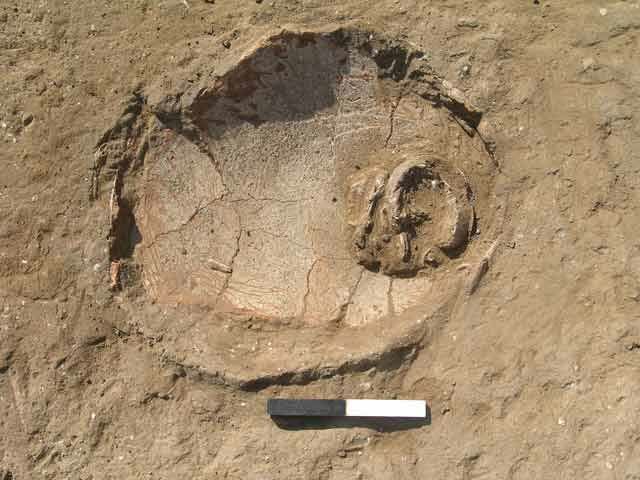 These sometimes related directly to architectural remains of Stratum III that had gone out of use, such as an infant jar burial atop an obsolete mud-brick silo, or in small mud-brick cists (Fig. 26). Other infant burials were found in holemouth jars (Fig. 27). Area L, located in the northeastern portion of the site, comprised the east–west section through the site and linked up to the north–south section (Figs. 28, 29). The excavation area was covered with a large overburden of sand; when removed, the exposed ancient topography was seen to have sloped moderately eastward. The eastern fringes of the area reached the very edge of the site, while the central portion revealed an agglomeration of building remains associated with Strata IV, III and II. The western part of the area was devoid of architectural remains and appears to represent a large open space between the building remains in the central part and those revealed in Areas A, I and H.
The remains of Stratum IV consisted of a kidney-shaped compound circumscribed by a mud-brick wall upon a partial stone foundation (W611, W617 and W620). An oval mud-brick structure in the west part of the compound had two entrances, one in the west and the other in the east. 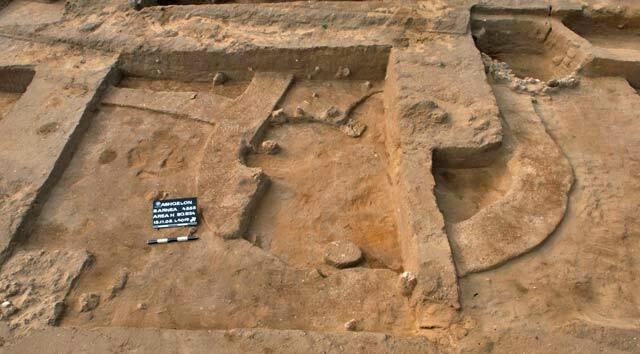 The eastern area of the compound was primarily open and included at least two mud-brick silos and several associated surfaces. During Stratum III, the Stratum IV compound was cancelled and two new mud-brick buildings of square shape with rounded corners were erected (Fig. 30). One of the silos from Stratum IV continued in use during Stratum III and was canceled in Stratum II (Fig. 31). As in most excavated areas of the site, Stratum III proved to be the largest and most intensely occupied, yielding a wealth of restorable ceramic and stone vessels upon its floors (Figs. 32, 33). None of the Stratum III elements continued in use in Stratum II. As in other excavated areas, the remains of this stratum were composed of a few eroded and flimsily built wall segments of unclear plan, in addition to several infant jar burials, one of which was found directly beneath a wall (Fig. 34). Area M was located at the southern end of the north–south section, south and adjacent to Area H and north of Area B, which was excavated during the first season (HA-ESI 117). As Area M was investigated at the end of the season, not all the architectural remains were fully exposed. Remains of Strata IV and III were revealed (Figs. 35, 36), but none of Stratum II. Stratum IV probably existed throughout the area, but was clearly exposed only in the southern part. The remains consisted of a large oval-shaped mud-brick building with two constructional phases, adjacent to another structure of unclear plan to its north. The remains of Stratum III included at least one enclosure wall that appears to have been separated from the enclosure in Area B by a wide space that consisted of several other walls of unclear plan and function, along with at least two mud-brick silos. 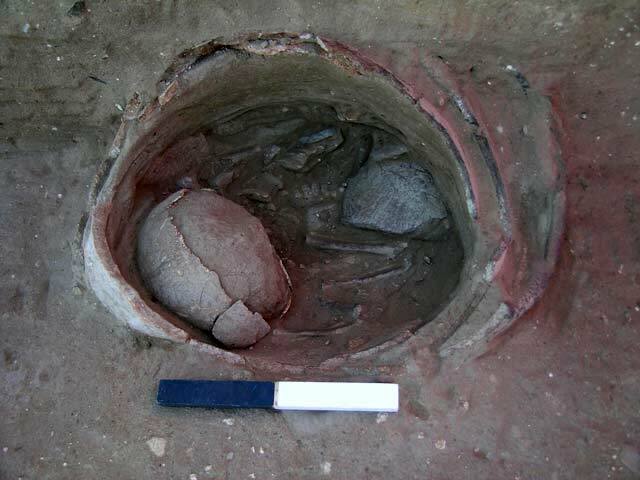 An infant burial wrapped with several large ceramic fragments (Figs. 37, 38) was revealed directly underneath a floor. The excavations at the EB site of Ashqelon Barne‘a exposed c. 8 dunams of a previously unknown site that is now lost forever due to development activities. 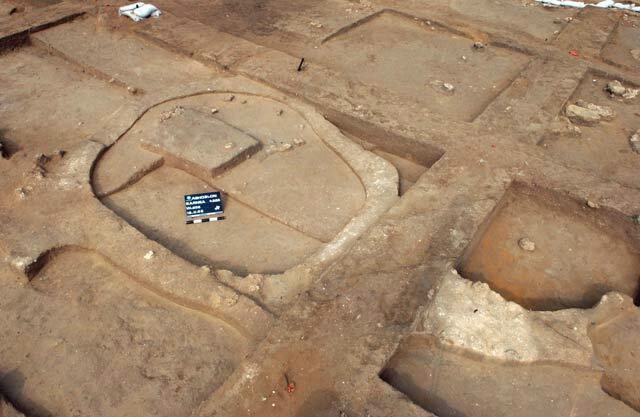 The scale of excavations enabled the evaluation of the site's growth, expansion and contraction throughout the three major phases (Strata IV–II) of its existence during the late EB IA and EB IB periods (34th–29th centuries BCE). The broad lateral exposures produced a wealth of building remains that provided an understanding of their function and relation to one another, an aspect not often attainable in archaeological excavations of this period. 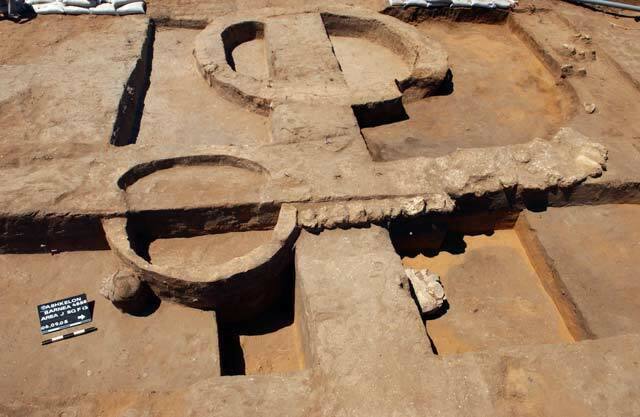 The excavations revealed a site composed of numerous compounds that were separated by narrow alleyways and by open areas, which may indicate a level of preconceived planning. These compounds were apparently used for domestic purposes, i.e., the living and working area of a family or possibly for industrial purposes, namely the processing of copper. 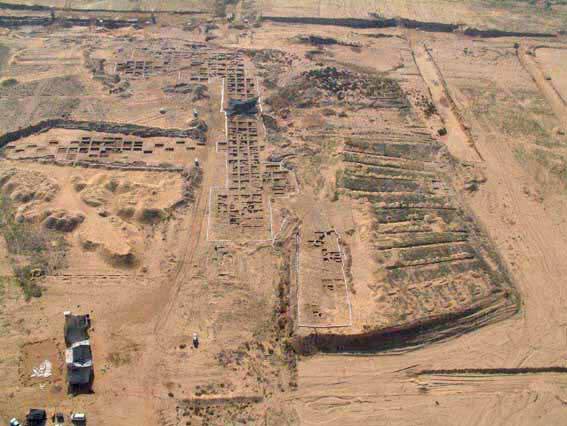 The large number of mud-brick silos is evidence of intensive storage at the site. 1. General view of excavation areas, looking south. 2. Location of excavation areas and extent of settlement. 3. Area A, Stratum III, plan. 4. Area A, looking north. 5. Area A, structure A2, looking south. 7. Area H, Stratum III, two compounds separated by an alley at lower center, looking north. 8. Area H, Stratum IV, part of a mud-brick structure, looking west. 9. 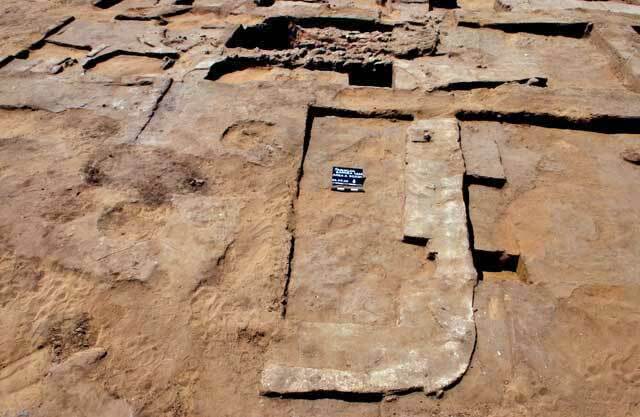 Area H, Stratum III, a large pithos found embedded in the floor. 10. Area H, burnt debris within industrial compound. 11. Area H, Stratum III, an infant burial in a storage jar found beneath a floor. 13. Area I, W215 of Stratum IV at right, looking southeast. 15. 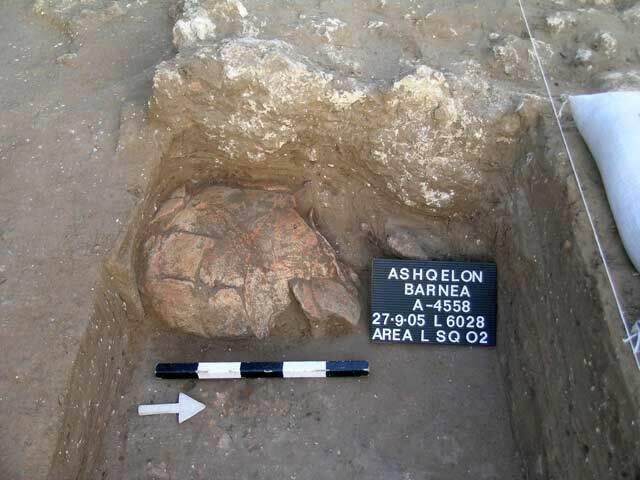 Area J, an infant jar burial. 16. Area J, mud-brick silo in north of area. 17. Area J, two mud-brick silos and enclosure wall. 19. Area K, Area B in background and Area M at upper right, looking west. 20. Area K, Building within surrounding wall of northern enclosure. 21. Area K, alley separating northern domestic enclosure at right from industrial enclosure of Area B at left, looking north. 22. Area K, alley separating between northern (left) and southern (right) enclosures, looking east. 23. Area K, east portion, looking west. 24. 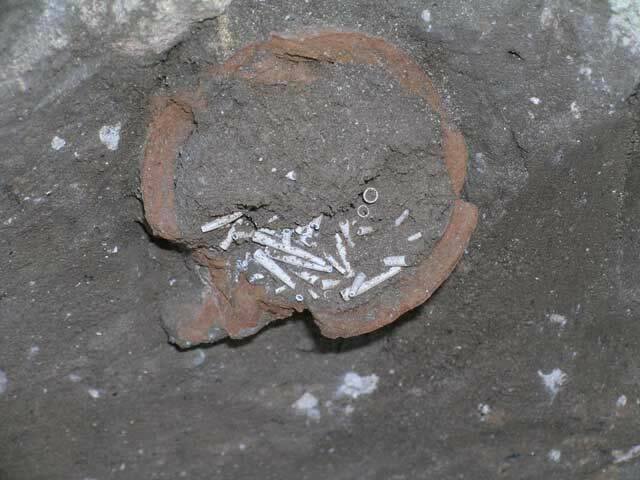 Area K, remains of juglet with hoard of dentalium shells. 25. Area K, Stratum II, architectural stone remains, looking south. 26. 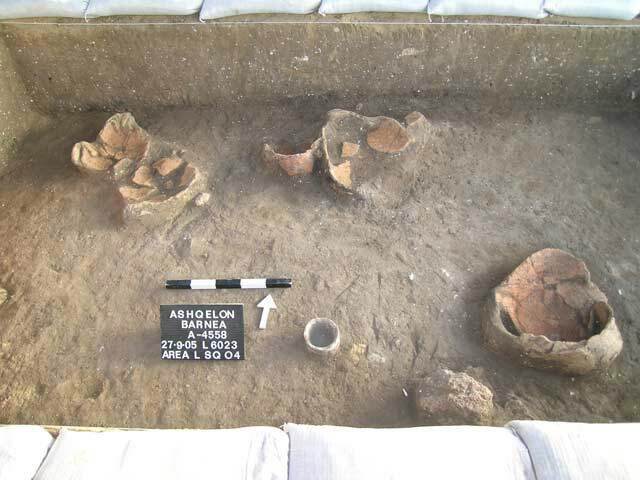 Area K, Stratum II, infant burials. 27. 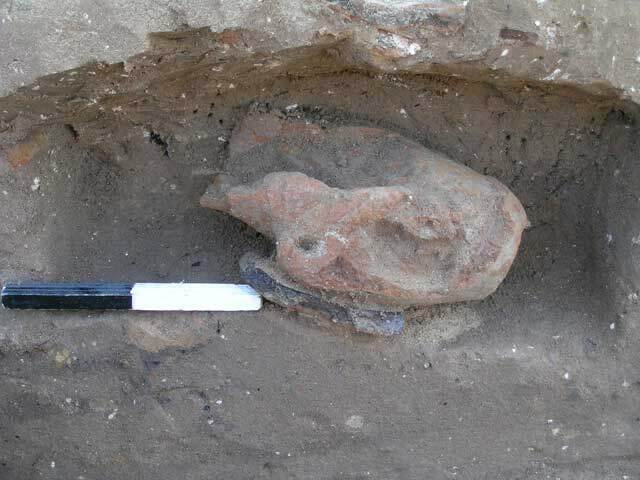 Area K, Stratum II, infant burial within holemouth jar. 29. Area L, in background, Areas A, H and M of north–south section¸ looking west. 30. Area L, Stratum III, mud-brick walls in central portion of area. 31. Area L, Strata IV, III, mud-brick silo overridden by Stratum II living surface. 32. Area L, Stratum III, ceramic vessel upon floor. 33. Area L, Stratum III, ceramic and stone vessels upon floor. 34. Area L, infant jar burial below stone wall. 36. Area M, south portion; north end of Area B at upper right, looking east. 37. 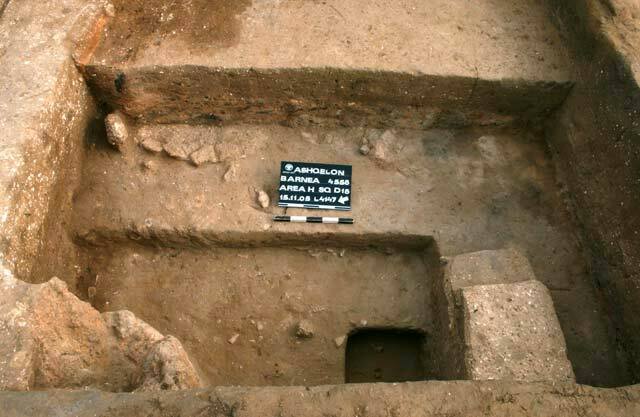 Area M, Stratum III, infant burial below floor. 38. 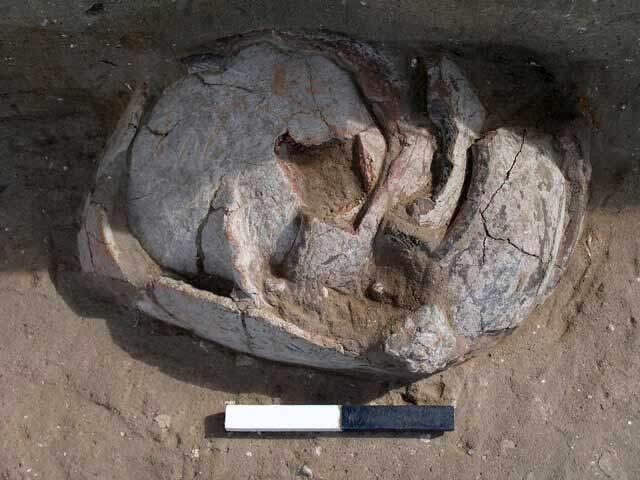 Area M, Stratum III, exposed infant burial.